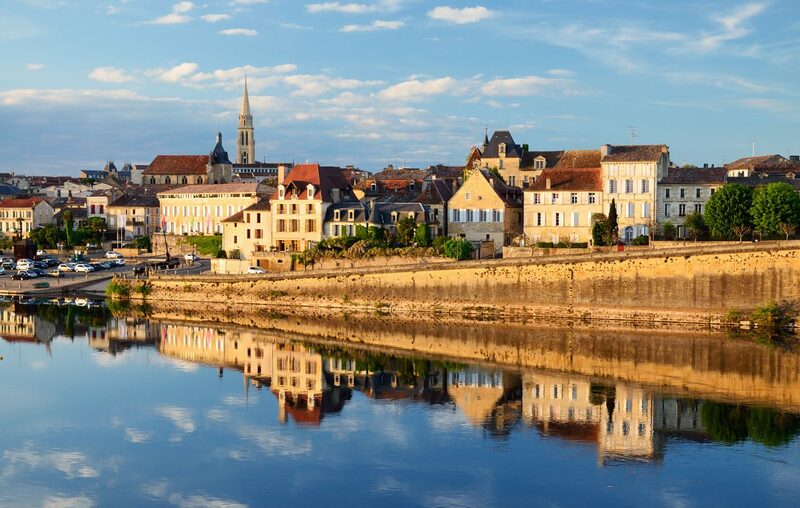 The beautiful city of Bergerac, along the Dordogne river in southern France. In 2015 we visited France for the first time, spending a few days in Paris and Bordeaux. With so many other trips on our bucket list, we didn’t have plans to return; but that changed when our friends Karen and Joe started talking to my wife and our good friend Connie. They were going on a bike trip in an area of France I knew nothing about. I admit I was dubious about going biking with a group of people I didn’t know, and who I expected were much more athletic than me. I love biking, but my idea of biking is 20 miles of flat bike trail and not much wind…preferably with lunch and wine at the end as a reward. After some initial protesting, I finally gave in and agreed to go…provided there would be good food and wine. We flew to Bordeaux and drove to Bergerac. Our first stop was Le Clos d’Argenson, the most amazing B&B I have ever stayed in. With just four stunning suites, it truly felt like home. Owners Pascal and Laurence were more than friendly, and the breakfast they served was perfect. An unexpected nicety was the fridge stocked with Bergerac wine; we could take what we wanted and leave 10 euros in a little bucket. On the counter for an evening snack was a freshly made lemon cake for us to enjoy. We had two nights there, but I would have been happy to stay a week. We set off to explore Bergerac and find a place for lunch. As we began our walk, we saw several statues of Cyrano de Bergerac, the 17th-century French novelist and inspiration for the famed 19th-century play. We bypassed some of the more touristy restaurants and stumbled upon a perfect place to enjoy some food and wine, Le Saint Jacques. We ordered our food and two bottles of red wine from the Bergerac region to enjoy on the lovely garden patio, punctuated by an old tree in the middle. This was a terrific wine to start our journey, with a reasonable price—I think the retail would be around $25. It was elegant, with plenty of smooth berry taste, beautiful color and a nice finish. We all loved this wine too. There were so many wines to fall in love with, but this was an excellent choice. Lots of dark fruit and plenty of life to live. Did you know that swans mate for life? Twenty-four years ago, Karen and I married. It’s been a great 24, and I wouldn’t trade it for anything. We didn’t want or need wedding gifts, and certainly not your normal things, like a toaster. So we came up with a novel idea and registered for wine at Premier. We’ve enjoyed so many of these bottles over the years, always with the giver in mind (I marked each with the giver’s name before storing them in our cellar) and we recently enjoyed the very last bottle. The wine —Joseph Swan Vineyard Frati Ranch Zinfandel—drank wonderfully, and we opened it with the corkscrew we gave out as favors at our wedding, embossed with our names on the side: a perfect way to commemorate our anniversary this year. Warren T. Colville is publisher and president of The Buffalo News.